In the 1830s the 6th Duke of Devonshire, owner of the Chatsworth Estate in Derbyshire, was one of the first to plant a pinetum and arboretum. He did this in partnership with Joseph Paxton, who later became famous for building the Crystal Palace exhibition in London. Taking a few acres of grazing land above the great house at Chatsworth, they set about planting trees systematically in accordance with the botanical classification used at the time. It's very clear that both the Duke and Joseph Paxton had great fun in their creation of some large-scale landscape features. 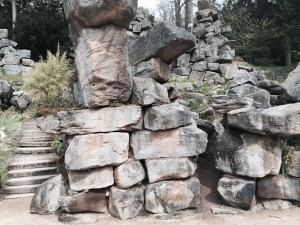 For example, they constructed a giant rock garden using stones weighing several tons, with one section described by a contemporary as a "miniature Matterhorn". 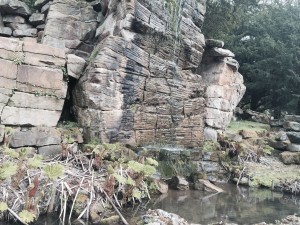 Unable to resist celebrating the newly-developed engineering methods, Paxton arranged one large rock so that it could be rotated with the lightest of touches; the pair also built an enormous fountain - which operates to this day, the Emperor Fountain. This was built to impress Nicholas I, the Russian Tsar, and is powered without pumps and using only the pressure of gravity from a height of 122 metres. Most of the trees in Paxton's Pinetum were found by overseas explorers who were bringing back seeds and saplings of newly discovered species. The pinetum trees included Cedar of Lebanon, Spruce, Monkey Puzzle (Araucaria), Douglas Fir, Larch and Japanese White Pine. Paxton and the Duke even moved large trees from elsewhere into the planting, with one eight ton tree being transported from Derby. Clearly expense was not an obstacle and at one stage they diverted a stream for over two miles so that it would run through their gardens as "The Trout Stream". 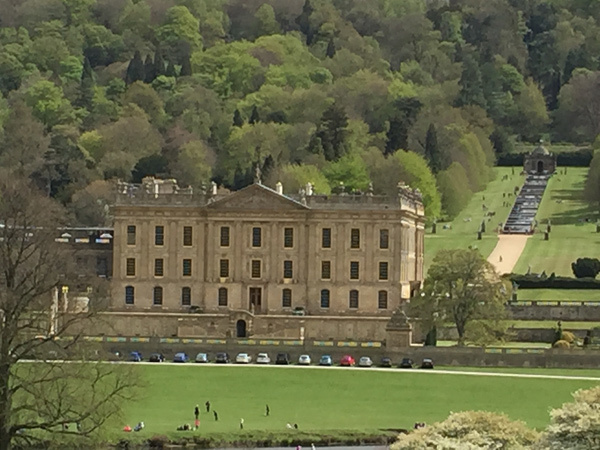 The Chatsworth house and gardens has been a spectacular commercial success which no doubt owes much to Deborah Mitford (1920 -2014) who, having married Andrew, the 11th Duke of Devonshire, proceeded to make the house and gardens an attraction for people far beyond their immediate Derbyshire catchment area. The estate now gets over 300,000 visitors each year and, apart from charging entrance fees for the house and grounds, it hosts weddings, courses and many events. The current Duke (officially called Andrew, but known as Stoker) has been very active in collecting and commissioning modern art and sculpture. Taking about the walk around the arboretum he says, "we take this two mile walk very often. Each area is planned to have a good view and a comfortable seat." 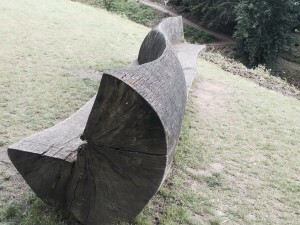 He has applied his enthusiasm for enjoying the view with an eye for creative woodland benches, which are themselves outdoor sculptures.